Black Friday is the most popular retail holiday of the year. If you plan on shopping this season, this guide will show you where to go and how to get the best deals. According to the National Retail Federation, roughly 174 million people visited retail stores or shopped online on Thanksgiving weekend in 2017, up from 151 million the year before. The average shopper spent about $335 during the four-day period, with about 75% of the total specifically earmarked for gifts. Most retailers offer exceptional shopping deals that are difficult or impossible to find any other day of the year. Thanks to extended hours and Thanksgiving evening blitzes at many retailers, it’s easier than ever to score great Black Friday deals without encountering crippling crowds or stress. In many cases, it’s no longer necessary to even leave the house. However, research and planning remain key to any successful Black Friday (or Thanksgiving evening) shopping trip. Use this Black Friday 2018 cheat sheet to draw up an efficient shopping plan that includes as many great deals as possible. Remember that some of the retailers outlined here specialize in specific product categories. For example, Home Depot specializes in home improvement and will have knowledgeable staff to help. Other retailers, such as Target and Walmart, take a more generalized approach that may require more DIY sleuthing. Also, unless otherwise noted, the in-store tips and deals outlined here also apply online – so if you forget anything while you’re out and about, all is not lost. Some deals are actually online-only. They’ll be waiting for you when you get home from a long day of shopping or on your phone as you wait in line at the store. It’s worth noting that major warehouse club stores, including Costco and Sam’s Club, also run Thanksgiving and Black Friday promotions. The catch is that all charge annual membership fees, so I haven’t noted them above and won’t include them in specific deals below. 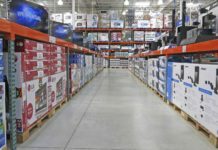 That said, if you’re at all intrigued by the promise of super cheap, bulk-bought merchandise, I’d definitely encourage you to read our post on determining whether warehouse club membership makes sense for you. Target is a general merchandise retailer with competitive store-wide Black Friday pricing. If you don’t want to get distracted by banners advertising deals on everything from clothing to household appliances, make a beeline for the electronics section, which is typically located on the back wall opposite the entrance. Keep in mind that while Target’s electronics employees are just as knowledgeable as their counterparts at specialized electronics retailers, other departments’ employees probably won’t be able to answer your electronics questions. To stretch your Black Friday dollars even further, sign up for a Target REDcard for an immediate 5% off your total purchase, plus 5% off on all future in-store and online purchases. (With relatively laid-back underwriting standards, it’s also a great way to build credit, and there’s a debit card option for credit-challenged shoppers.) REDcard holders also get exclusive access to early Black Friday deals, beginning 11/21/18. There’s more. Guests who spend $50 on Black Friday receive a voucher for 20% off a future Target shopping trip. And, for the duration of the holiday season, Target is offering free shipping on all online orders in the continental United States. Select Black Friday deals are available online starting early in the day on Thanksgiving. Walmart is synonymous with general merchandise retailing. No surprise, then, that it’s a great place to find Black Friday deals on small electronics and accessories. Walmart boasts across-the-board discounts (up to 50% in many cases) on small electronics starting early Thanksgiving evening. One minor downside this year: It appears that Walmart’s famous 1-Hour Guarantee, a series of flash deals stretching through Thanksgiving weekend, has been discontinued – perhaps becoming a victim of its own success. Still, the headline discounts on phones, gadgets, and accessories should be enough to get you in the door. Use Walmart’s color-coded Black Friday map to quickly locate deals in your favorite merchandise categories. Before you head to your nearest Walmart location, download Walmart’s iPhone or Android app, which has useful Black Friday store maps that point you to hot in-store deals at your home Walmart (use the store locator to select the right one). Also, all online purchases greater than $50 qualify for free shipping in the continental U.S.
Best Buy is the strongest of the U.S.’s surviving big-box electronics retailers. Thanks to uber-knowledgeable employees, it’s also arguably the best electronics retailer for Black Friday shoppers who don’t quite know what they want when they walk into the store. Every Best Buy employee is an expert in something, and with stores staffed to the gills on Black Friday, you’re sure to find someone to answer your questions quickly. If you prefer to shop online, Best Buy offers free shipping on all purchases through the holidays. If you encounter a problem with a Black Friday purchase at some point in the future, Best Buy’s Geek Squad team offers expert advice, troubleshooting, and repair – often included in item warranties. Geek Squad service and protection policies can be pricey, at times well north of $100, but they’re worthwhile for consumers looking to protect their investments years into the future. If you’re not sure an extended retail warranty is the right call for your new electronic device, check out our post on determining whether an extended warranty is worth the cost. Fry’s Home Electronics is a regional electronics retailer that mainly serves the southern and western states. The company’s employees are every bit as knowledgeable as Best Buy’s, and the “order online, pick up in-store” process is seamless. Plus, Fry’s pays sales tax on select items where applicable. This year, Fry’s is running “Black Friday all November long” sales, lessening the pressure on casual shoppers looking to get a head start on holiday gift-buying. But Black Friday die-hards shouldn’t fear: The best deals are reserved for the day after Thanksgiving, as always. If you’re a frequent online shopper, set up a myFry’s account for an expedited checkout process. Staples is one of the country’s leading office supply stores, so its employees are great at dispensing advice on which phones, tablets, and other gadgets are ideal for small business use. Throw in discounts of 70% or more on electronic devices, accessories, supplies, and equipment, and Staples’ Black Friday sale offers an unmissable opportunity to cut your business expenses. Staples More Account (store credit card with no annual fee) cardholders get an additional 5% off in-store and online purchases, free shipping for online purchases, and $50 off their first purchase of $150 or more. Those who have a More Account also get deferred (0% interest) financing for large purchases: 6 months for purchases greater than $299, 12 months for purchases greater than $499, and 18 months for purchases greater than $799. If you get chills at the thought of braving Black Friday crowds at the big-box store, skip the rush and head to the Verizon Store. Although Verizon plans and products are widely available at Best Buy and other large-format retailers, the branded stores offer a host of deals that aren’t available anywhere else. It’s worth making an extra stop (or heading online) to see what you could save on a new phone or plan. If you’re a current Verizon customer, you probably received an email advertising exclusive device markdowns (often 50% or greater) in the run-up to Black Friday. Those deals are good online and in-store. Just know that Verizon’s Black Friday deals are notoriously fickle, so it’s not a bad idea to call ahead and make sure your desired items are still in stock at the advertised price. The AT&T Store‘s appeal is the same as the Verizon Store’s: similar savings and less chaos relative to big box retailers. AT&T’s inventory is also similar to Verizon’s, offering both in-store and online-only deals that can’t be found anywhere else. The online deals are particularly juicy, though many require a two-year contract. In-store staff members are generally helpful and unhurried. The website could use a little work, but you should still be able to find what you’re looking for online. Kohl’s is a general merchandise retailer that focuses on clothing, toys, gadgets, and durable home goods. Though it’s not really known for its electronics selection, you’ll find plenty of deals worth writing home about. Kohl’s typically runs multiple Black Friday and Thanksgiving week promotions in parallel, starting as early as November 19 this year. Check the website frequently for deals in force in your area, and remember that promotions are likely to change as the week goes on. Walmart has an expansive selection of flat-screen televisions and accessories. Somewhat surprisingly, the retail giant is one of the best places to find Black Friday deals on these items, period – in many cases outstripping dedicated electronics retailers such as Best Buy and Fry’s. If you really want to impress your friends and snag a great deal in the process, inquire at your local Walmart’s electronics section about Walmart-exclusive TV brands. Target is upping its TV game these days. It’s advertising its lowest price ever on the popular Westinghouse 55-inch UHD TV, and it’s slashing prices on smaller TVs by 50% or more too. Deals are particularly good on off-brand items from manufacturers like Polaroid and Element. Best Buy’s 2018 Black Friday TV deals are among the year’s best consumer electronics deals anywhere – online or in-store. Discounts north of 70% aren’t uncommon, particularly during doorbuster hours on Friday morning. For even deeper discounts, check out Best Buy’s “Beat the Rush” deals, which are available in the days leading up to Black Friday. Note that some of the best deals, including the one called out here, are in-store only. Fry’s has an impressive collection of affordable TVs, including many compact LED and smart TVs that fit right into the kitchen or bedroom. Mail-in and instant rebates can further reduce the cost of these machines. Some online deals require special promo codes – if you can’t find them in the product listings, do a quick Google search. Walmart’s laptop and PC selection is just as impressive as its TV selection, and it’s possible to find Walmart-exclusive models from HP, Dell, and other well-known manufacturers. Check Walmart’s website for online-only deals and promotions too. Best Buy reliably stocks just-released laptops and PCs at industry-leading prices. Black Friday discounts of 30% to 50% aren’t uncommon, even on models that are hot off the assembly line. Geek Squad protection plans really shine on higher-priced devices. If you’re lucky enough to live in its territory, Fry’s is one of the best stores to visit for eye-popping discounts on already affordable devices, particularly if you don’t care about having the latest or fanciest model. Keep in mind that some of the best deals require mail-in rebates, and many of the deepest discounts are reserved for refurbished devices. Staples has a nice lineup of larger electronics too, including laptops, PCs, and two-in-one devices. Though you have to dig to find spectacular deals, it is absolutely worth your time, particularly if you’re seeking low-cost items made even more affordable by Staples’ deep Black Friday discounts. Walmart has a huge stock of toys and games. Check out its Black Friday discounts on the latest gaming consoles, games, and non-digital playtime accessories for kids of all ages. If you buy online, your order may qualify for free shipping, provided you spend at least $35. Kmart is a well-known discount merchandise chain that is part of the Sears retail family, and it features an ample selection of toys for kids of all ages. Online orders of $35 or more qualify for free shipping. Note some online deals in Kmart’s Black Friday flyer are sold through Sears, its sister store. Make sure you’re clicking the right links before you buy. Sign up for the Sears Card from Citi to get $5 off your first purchase of $50 or more at any Kmart location. And, when you spend more than $50 in Kmart stores, you get a voucher good for $0.20 per gallon off gas purchases of up to 20 gallons at participating Speedway, BP, and Kmart Express gas stations. Kohl’s really shines in the kids’ merchandise department. It’s not uncommon to find discounts of 60% or better on slow-selling toys and accessories. Lowe’s is a national home improvement chain that’s basically paradise for DIY fixers and handy types. Typically, in-store staff members are a bit more plentiful and hands-on than those at other big-box home improvement chains, including Home Depot, Lowe’s biggest competitor. Online orders greater than $49 qualify for free shipping. Sign up for the Lowe’s Consumer Credit Card to receive an additional 5% off all in-store or online purchases. Active-duty military and vets get another 10% off eligible purchases. And be sure to look out for special one-day-only deals throughout the holiday season, including the run-up to Black Friday – they’re often far better than advertised specials. Home Depot is a one-stop home improvement superstore that offers competitive prices year-round. On Black Friday, the deals seem almost too good to be true. Watch for “special deals of the day,” which promise savings of 50% or more on certain items (such as a Hoover Air Lite Compact vacuum cleaner). When purchased online, these deals always earn free shipping or local delivery (store to house), regardless of order size. Also, you can do free same-day pickup at your local store on pretty much any online purchase. Menards is a home improvement retailer with stores in more than a dozen northern states. It’s best known for its frequent “take an additional 11% off” sales and industry-leading prices on lumber, paint, and plumbing supplies, and its warehouse-like stores are more consumer-friendly than Home Depot and Lowe’s outlets. To boost your Black Friday savings, apply for the Menards BIG Card from Capital One. Every time you make a purchase, you earn 2% rebate on all purchases, redeemable for in-store or online Menards purchases once you earn at least $5 in rebates. You can also take advantage of six months of interest-free financing on purchases greater than $299, and 3.99% APR financing for 48 months on purchases greater than $1,500. Also, the BIG Card earns an additional 1% rebate on purchases at Speedway, Holiday, and Kwik Trip/Kwik Star convenience stores, redeemable for Menards purchases. If you’re not sure the BIG Card is the right Capital One credit product for you, check out the Capital One Quicksilver Cash Rewards Credit Card, which earns unlimited 1.5% cash back on all purchases. If you own your own business, look into Capital One Spark Cash for Business, which earns unlimited 2% cash back on all purchases. With more than 4,600 locally owned, small-format stores nationwide, Ace Hardware is a neighborhood alternative to Home Depot, Lowe’s, and Menards. If you’re going to be out and about on Small Business Saturday – the day after Black Friday – make Ace one of your first stops. Prices are competitive with those of larger home improvement retailers throughout Black Friday weekend. Although Target certainly shouldn’t be your first choice for high-fashion purchases, it’s definitely more chic than big-box peers Walmart and Kmart. And its pricing power is evident in deep, broad Black Friday deals on everyday apparel and accessories. Old Navy is known for apparel bargains year-round, but its Black Friday deal is truly magnificent: shoppers simply get 50% off the entire store, with even deeper discounts on select items. $1 socks, anyone? If you’re shopping online, you can apply multiple coupon codes to the same item (if applicable) to boost your spending power. The multi-coupon trick doesn’t work in-store, however. The annual Macy’s Thanksgiving Day Parade isn’t the only reason Macy’s is synonymous with holiday shopping. The famed department store offers deep Black Friday discounts on virtually everything in the store, from high-end beauty products to budget-friendly clothes. Arrive earlier in the week (starting November 19 or before) or shop online for sneak-peek discounts on more than 100 popular items, including name-brand infant and toddler clothinng. Once the go-to retailer for affordable, fashionable clothing, JCPenney has lost some of its luster since the early 2000s. But with more than 1,000 stores in 49 states, it’s still a top destination for clothing bargains. In the past, JCPenney has offered doorbuster coupons for early arrivals on Thanksgiving: anywhere from $10 to $500 off your total purchase, depending on when you arrive. These doorbuster coupons kicked in as soon as you clear their face value – $500 off purchases of $500 or more, and so on – so they’re far more powerful than your typical Black Friday discount. Check ahead this year for current promotions. If you’re shopping online, spend $49 or more for free shipping. Kmart is a great place to find clothing and apparel deals for the whole family. Shop online earlier in the week (starting November 19 or earlier) for Black Friday VIP Preview discounts up to 50%. Sears is a major appliance and home improvement retailer. Though the company has fallen on hard times since the Great Recession, it’s still a great place to find Black Friday deals on its high-quality Kenmore appliance line. Sears Card holders save an additional 5% on all purchases and earn 12-month special financing (interest-free) on appliance purchases greater than $399. Online orders over $25 qualify for free shipping. Home Depot’s Black Friday appliance sale promises up to 40% off select models, with daily deals pushing savings north of 50% on select merchandise. Sign up for Home Depot’s mailing list and automatically get $5 off your next order. If you’re a landlord or remodeler in the market for multiple major appliances, buy two or more worth $498 or more each to get up to $500 off your purchase. When you open a Lowe’s Consumer Credit Card account, you get your choice of 18 months’ special financing (interest-free) or blanket 5% discounts on purchases greater than $299, which covers most appliance buys. Though special financing is available year-round, it’s an opportunity to reduce the upfront cost of Black Friday specials. Walmart isn’t the best place to shop for major appliances – that honor falls to any of the home improvement stores listed in this section. But it’s not a bad source for countertop appliances and kitchen accessories. I found top-of-the-line coffeemakers for under $10. Pay no mind to the “Home Electronics” portion of the name: Fry’s has an impressive selection of non-electronics, including home appliances. Most discounts come via instant rebate, so there’s no action required after the fact. Target has lots more up its Black Friday sleeve. One promotion that really caught my eye last year – and that doesn’t really fit into any of the categories above – is a cool 50% off deal on some high-end vacuum cleaners. This year, I’m eyeing deep discounts on baby products, like strollers and car seats. Like Target, Walmart has a slew of Black Friday deals that don’t neatly fit into any of these popular categories. This year’s furniture and home goods selections are better than I remember from years past, for instance. The BH&G lighting deal referenced here includes two stylish table lamps and a sturdy standing lamp. Many U.S. retailers offer expansive price match guarantees on full-price and on-sale holiday merchandise. If you plan to shop at more than one location on Black Friday, or if you plan to follow millions of your fellow shoppers and complement in-store buys with online purchases, don’t forget to keep your receipts on hand – whether in your wallet, handbag, or email account. This simple step costs nothing to take, and the potential payoff is huge. However, not all retailers make it easy to take advantage of price match guarantees. Take the time to read, in detail, every retailer’s price match policy. Though some policies are customer-friendly, others are restrictive. For instance, Best Buy’s price match guarantee covers all local competitors, plus online deals offered by brick-and-mortar retailers operating in your area; however, it excludes most online-only retailers. What’s more, most price -match policies require covered items to be exactly the same: same model number or SKU, same size, same specs, same trim, and so on. Even slight variations can void a seemingly generous price match policy. Also, most retailers pointedly exempt clearance items from price matching, meaning many of the deepest Black Friday deals aren’t eligible. On the bright side, retailers want your business, and they’re apt to grease squeaky wheels – so, if and when you do invoke a price match policy, don’t be afraid to escalate your complaint as high up the chain of command as necessary. A backlash is brewing against one of the most popular Black Friday alternatives: shopping during Thanksgiving Day. The Mall of America, one of North America’s largest retail centers, made waves this year when it announced that it would encourage its stores to close on Thanksgiving. According to KARE 11, only three Mall of America stores chose to remain open on Thanksgiving Day 2016 – a sharp departure from previous years. Other malls, shopping districts, and individual retailers followed suit; I noticed several on this list that chose to close on Thanksgiving 2017 and 2018 after opening in 2016. This is great news for retail employees who work hard during the holidays and surely deserve time off with their families. On the other hand, it’s likely to increase traffic on Black Friday and the rest of the long post-Thanksgiving weekend. Therefore, in a more crowded, higher-stakes holiday shopping environment, pre-Black Friday planning is more important than ever. Use this guide to create a detailed list of your intended shopping destinations. Determine what you want to buy at each place. Come up with some alternatives for each item in case you can’t find it in stock. And don’t forget to keep this post handy on your phone as you work your way through the aisles. And if you forget something when your Black Friday shopping bonanza is done? Well, there’s always Cyber Monday. What’s your plan for Black Friday 2018?